Infinity Broadcasting’s Outlaw Country 92.5 (WYUU, licensed to Safety Harbor, FL) found itself as the third country station in a two country station market when Clear Channel’s Thunder 103.5 (WTBT) flipped to Country as U.S. 103.5 (WFUS) on April 14, 2005. With Infinity co-owned WQYK also playing country in the market, it became obvious to many observers that something had to give, particularly with country stations out of Polk County and Sarasota edging into the fringes of the Tampa/St. Petersburg/Clearwater market. On August 7, 2005, WYUU flipped formats following its broadcast of the Indianapolis Brickyard 400 NASCAR race. 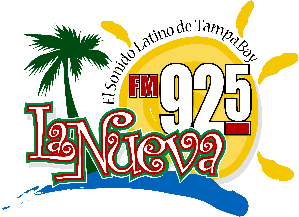 After three commercials, this announcement told listeners that a new format had come to the signal: La Nueva 92.5, The Latin Sound of Tampa Bay.